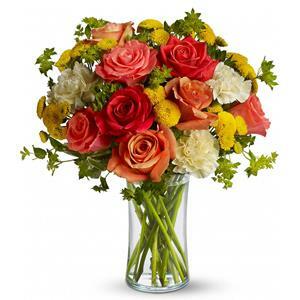 Dark orange, coral and orange roses, light yellow carnations, yellow button spray chrysanthemums and greens fill a slender gathering vase. It's a kiss of summer! We can usually delivery same day for all orders placed before 2:00PST, if after that time, call us we will do our best to accomodate you. Hospital deliveries: Please check the recipient's expected release date and schedule your delivery accordingly. All claims must be received within 48 hours. In the event there has been an error, we must receive notification within 48 hours in order to remedy the situation. We cannot correct a problem once the gift is no longer in saleable condition.